Before I get into this week's Hangover, I must address the growing issue of throwback uniforms. Roger Goodell talks about how arrests and behavioral problems embarrass the league. But they have nothing on throwback uniforms. 1. Have at least some fashion sense. The Denver Broncos uniforms. My. God. I heard the announcer say they were throwbacks to the franchise's original uniform in 1960. I seriously doubt this. Why would the original design of the team's uniform be based on the colors seen at the bottom of a bronco's stall? That's disgusting. 1960 was not a crude time. No, there has to be some other explanation. My guess: While the rest of the league is wearing pink for Breast Cancer Awareness Month, the Broncos are trying to create awareness about some sort of digestive ailment. 2. Be mindful of what you're throwing back to. The New England Patriots of the silver and nautical blue uniforms from the mid-'90s to today: good. The New England Patriots of the helmets with the 1700s long-snapper on it: horrible. Why remind your fans of a past they'd rather forget? And why bring that bad karma on your team? The Patriots are a mediocre 1-1 in their throwbacks this year. Worse, those old uniforms have made the Tom Brady to Randy Moss connection look and play more like Hugh Millen to Irving Fryar. 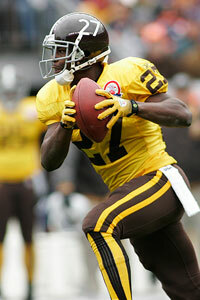 AP Photo/Barry Gutierrez Ugliest throwback unis we've seen this season? 3. Be true to your color scheme. We all know the true purpose of throwback uniforms. It's not to honor anything. It's to sell more jerseys. I guess you could say it's to honor increased revenue. But if your throwback introduces a new color scheme, all it does is dilute the uniform look of the crowd. Take the Pittsburgh Penguins throwback jerseys. The baby blues are sweet. But light blue scattered among a crowd of black and gold: dumb. The Kansas City Chiefs got the color scheme right Sunday by staying with their red and white. Where they messed up was wearing a helmet designating the home state and city of the team that defeated them. That's pathetic. If the NFL ever expands to Europe, the Chiefs can become the Stockholm syndrome. Consider the children. My nephew pounded a juice box Sunday and then came into the living room and saw Knowshon Moreno, his striped socks spiraled around his calves, peel off a long run as his legs whirred in a magical, mesmerizing pinwheel. Now my nephew will spend the rest of his life seeking a similar high. He's ruined. Here's a crazy idea. How about wearing a non-throwback uniform sometimes? I know -- crazy, right? But it just might catch on. That's Browns QB Derek Anderson's stat line against the Bills. And his team won. See, this is the difference between those gaudy fantasy stats, like you see above, and the stats that really matter, the kind of stats that lead to victory. At least, they do if you're playing the Bills. "We lost to Detroit on the road. We come here and lose to Carolina. This one stings more." Ouch, Panthers. The Washington Redskins know awful. And you, sirs, are no Detroit Lions. • "I wish I could lateral this heartbreak to someone." • "Is it hard to break into officiating? I mean, do you think you guys could get me a job? I don't know a ton about football, but I could study up." • "I will visualize myself not throwing an interception. Crap. Still picked off." • "Thank you for getting me through another play without injury." • "I got tickets to the 'Astro Boy' premiere! Yaaaaaaaah!" • "I forgot my hat today. Do we have anything to replace it? No, a toupee will not do." • "Ah, why not? I'll try one underhand. Couldn't be any worse." • "If we don't win, I'll have to do like my boss and resort to plastic surgery to turn this frown upside down." • "Look, you may have on different helmets, but I'm not fooled. You stink. So you're not getting those calls." • "I just came here to shake your hand. I don't want to hear your spiel about eternity, OK?" • "Hypothetically we're a dynamic offense." "You know it." • "Hey, ref! There's a man over there who wishes me harm! I want him punished!" • "I'm not letting you go. Please come back. My stats stink without you." duh! McDaniels is the only hope to keep Belichick's coaching tree alive. If any more parts of it died, it would get chopped down and made into mulch. 2. Everyone wants to talk about how the Patriots aren't scaring anyone on offense anymore. And how their defense is nothing special. Sure. Fine. But if you really want evidence that the Patriots are no longer feared, I present this. What an adorably harmless little man. 3. I am as in the know as it gets. Here's a tip I got Sunday. See this helmet the Chiefs wore? See that star marking? That's the exact location Jerry Jones would have buried Wade Phillips' body had the Cowboys lost to the Chiefs. It's true! 4. Deion Sanders says he had nothing to do with Oklahoma State's Dez Bryant's getting in trouble. He also says he had no role in any tampering in regard to Michael Crabtree. Who knows? But I'm starting to get how this NFL system works. Players meet Sanders, then get in trouble. And then are passed on to Tony Dungy for rehabilitation. 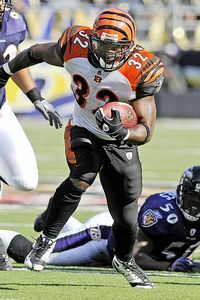 AP Photo/Nick Wass Cedric Benson has turned into a quality NFL running back after all! 5. Mike Tomlin won the Super Bowl last year at age 36. Josh McDaniels has the Broncos at 5-0 at 33. The NFL is a league of copycats and trends. In a few years we may see the first teenage coach. It will be just in time for the maturing Eli Manning to be a player/coach. 6. Congratulations to Cedric Benson on becoming the first running back to run for 100 yards in a game against the Ravens since December 2006. You might think Benson doesn't deserve such a distinction, but consider he has rushed for 73 yards or more in his past eight games. He's pretty good now. Benson got off to a slow start in his career. But now he's tough to stop. In that way, he's sort of like a big boat captained by a drunk guy. 7. Cincinnati's win over Pittsburgh two weeks ago was impressive. But that was at home. Winning on the road in Baltimore in front of those loud fans is far more impressive. Especially because the noise was tripled due to Gus Johnson's screaming. 8. Sunday was not a good day for Boston sports fans. Jonathan Papelbon blew a save and the Red Sox were eliminated -- then a few hours later the Patriots lost to the Broncos. It's good the Celtics won their preseason game, or New England fans would have had to convince themselves Monday that they've always much preferred the Bruins and Revolution. 9. It's not all bad for the Patriots, though. Did you notice the Broncos were also sporting throwback end zones? They had an argyle pattern. Chances are Tom Brady didn't leave town before asking the designer to make him a scarf to match. 10. Derek Anderson was 2-for-17 yesterday, with 23 yards passing and one interception. On the road. And his team won. I know I mentioned this already, but I'm going to need to write it a few more times until it seems real. 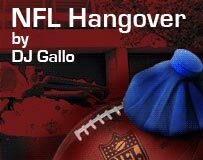 DJ Gallo is the founder of and sole writer for the sports satire site SportsPickle.com. He also is a regular contributor to ESPN The Magazine and has written for The Onion and Cracked. His first book, "SportsPickle Presents: The View from the Upper Deck," is on sale now.